I've always been a big believer in "fake it til you make it." Actions speak louder than words...and if you're acting like you know what's going on, it usually comes true. #BlogElul and #Elulgram have inspired, informed, and offered a little bit of additional introspection across the internet for the last few years. I'm not sure that you're all exactly excited to see it, but just as the calendar makes its way around again towards Tishri...so too does #BlogElul come around again. So what's it all about? 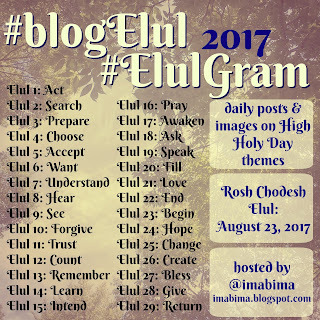 I have made a list of Elul-related topics, and I'm inviting you (yes, you! reader, colleague, friend...anyone with a desire to share ideas about the holidays) to join me. But you don't have to stop with "blogging." Sure, it's called BlogElul but you can "blog" in any way you like. Maybe it's your daily Facebook update or tweet. Maybe it's your Instagram photos or SnapChat story? Now we have quick-video services -- perhaps a daily 6-second video? (Challenge: somehow use that cool Boomerang app…) Maybe you don't want to do it daily. Maybe you just want to dip your toe into the experience, or just read (and share?) what others write. It's totally up to you. I always love to see the creative things that the #BlogElul community comes up with. There are no rules. I provide the topics (see graphic or below for text) for each of the days of the month. Just write a post of some kind about that topic on that day. Use the hashtag to share your post (I like to put it in my titles) and share other people's posts as well. This could be a way to revitalize your blog, kickstart a new project, or even just get yourself ready for the holidays! I know that lots of people use #BlogElul as a spiritual exercise each year, and I'm so proud to be a part of their yearly journey through Elul. I'm looking forward to sharing this journey with you. Elul begins on August 23rd (it's always on time), so I wanted to give you a head start if you're going to pre-write some of your posts. I hope that our shared preparation for 5778 brings meaning and hope, inspiration and enlightenment for all of us.